This interesting Scottish name derives from "Ad", a pet form of the Hebrew male given name "Adam", meaning "red earth", with reference to the substance from which the first man was formed, plus the Olde English pre 7th Century diminutive suffix "-kin". 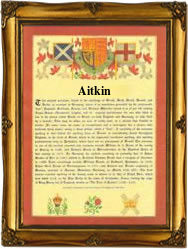 One Atkyn de Barr is recorded in Ayrshire, in 1340. The surname first appears in the early 15th Century (see below), and Andrew Atkin appears as a witness in Aberdeen in 1469. Since the mid 17th Century the name has been widespread in north-east Ulster, the earliest reference being to William Ekyn, lessee on the Cunningham estate in 1613. In the modern idiom, the surname has many variant spellings including: Aiken, Aicken, Aikin, Aitkin, Aitken, Atkin, Aickin and Aitin. On September 17th 1590, Violet Aiken married George Young at South Leith, Midlothian, and Agnes, daughter of John Aiken, was christened on February 26th 1610, at Dalkeith, also in Midlothian. Some outstanding namebearers were Dr. Joseph Aiken, author of "Londerias", a description in verse of the seige of Derry from the Protestant defender's point of view, published a few years after that event; and Frank Aiken, Irish Minister for External Affairs, whose work at the United Nations was significant. The first recorded spelling of the family name is shown to be that of John Akyne, which was dated 1405, in Baines, "Records of Scotland", during the reign of King Robert "The Stuart" of Scotland, 1371 - 1420. Surnames became necessary when governments introduced personal taxation. In England this was known as Poll Tax. Throughout the centuries, surnames in every country have continued to "develop" often leading to astonishing variants of the original spelling.